You claim you belong to the only true church, revealed through God, and that God tells you to try to change the beliefs of other people who believe that same God is telling them something different. That is arrogance. Mormonism does not contain the only good people in the world. You may truly believe you are right, but your friend may truly believe she is also right. You will cry that I am persecuting your beliefs. I'm only trying to get you to think outside the Mormon box. Hold whatever beliefs you wish, but please do not continue to tell the rest of us we are wrong. I don't feel the need to defend my beliefs to anyone. I recognize your church's push for missionary work, but I don't think you realize how much harm you are actually doing to your belief system with these posts. I'm sure my post will only reinforce your stance, but I had to jump in anyway. I am familiar enough with Mormonism to understand the mindset and how you will be able to twist this in favor of your truth. Just for once really stop and wonder why the same God would be telling so many people so many different “truths” that are confirmed by their own “spirit of revelation”. I think you were very kind in your differing and I wouldn't call what you said persecution at all, so thank you. I am glad to have you as a reader to my blog because I do believe that true strength and friendship is forged in people's differences. I don't think that Mormonism has a corner on being good people or that people of other religious tenets aren't following truth so I do apologize if that is how I came across…arrogant, as you put it. 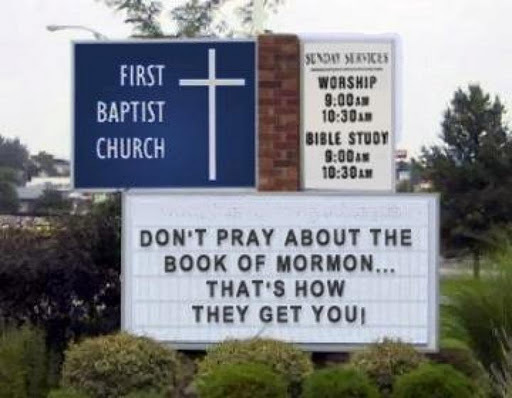 That is a common complaint of people about Mormons, that we are arrogant, and I get it. I really do. 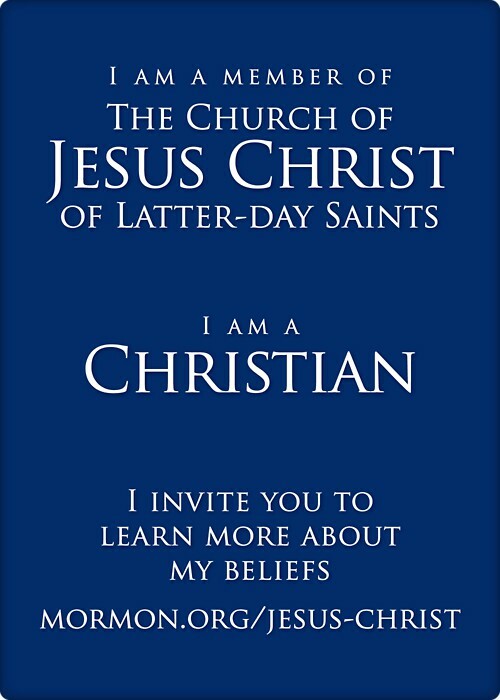 I think if you were to meet me in person, you would see that I have plenty of room in my heart for the non-Mormon people. In fact I usually prefer to hang out with people not of my faith, just because I do like to learn about others beliefs so much. Most of my best friends are not members of my church and of course they are some of the absolutely greatest people I know. You are right about the persecution of Muslims and Jews. Maybe I should have rephrased what I said to Mormonism is the most persecuted of Christian religion. Besides the Jews, Mormons are the only religious sect that have had a extermination order against them…it happened in the US of A of all places. I do disagree with you on one thing. How is telling what I love about my church harmful to my belief system. I would not go to any other person's blog and tell them that they shouldn't use their blog to talk of their beliefs. In fact, I wish that more people would. I have been inspired by so many people of different faiths and hope that they would believe in their beliefs enough to want to share them with others. I don't take any offense from other religious people talking of their beliefs, in fact, it's quite the opposite…they usually inspire me to be a better person. I would expect others people to claim that they belong to the only true church revealed by God because if they can't make that claim then why belong to the church in the first place? I came over to your profile and saw that you are from Lehi. I would love to get together some time. We don't have to talk about religion. I would love to hear more of your daughter's story. I have a special place in my heart for special needs' kids. I say this as humbly as possible but I do love the belief I have been given by my church leaders that those special needs kids were the most valiant in the pre-mortal life. I believe that will all my heart. I just want you to know that this post and your comment were so inspiring to me!! I have had such a rough time lately, and being reminded of all that we believe in, by someone that lives it everyday, means more to me than you know!! THANK YOU!! We sure miss you around here!!! I guess you didn't realize that the first sign image you posted was fake. 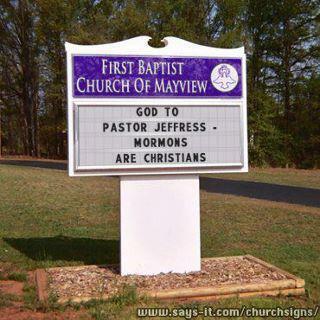 Go to the web address on the bottom and you will see how you can make a sign that says anything with FBC-Mayview being the “church.” You can even change the name of the church in the sign generator. So, you thanked a church that ultimately doesn't exist. Here, I made a sign for you: HERE! !